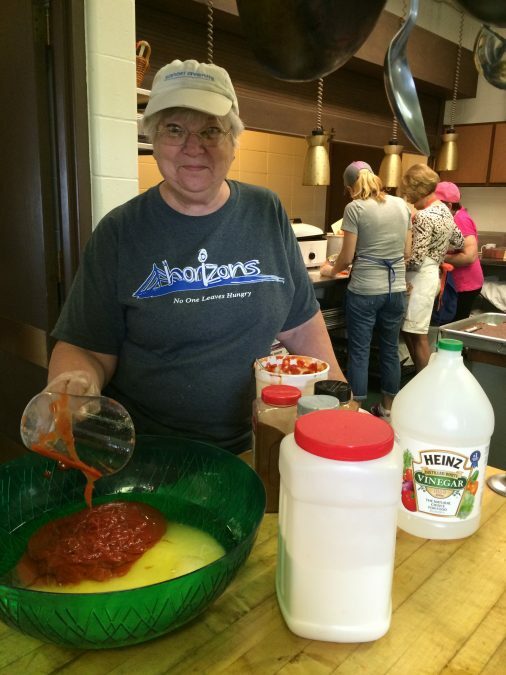 Jane Hessing, a volunteer from St. Peter’s Catholic Church has been with Horizons from the very beginning. She serves with a smile on her face and love in her heart! Why do you volunteer at Horizons? I think it’s important to give back to the community, help the less fortunate and thank God for the Blessings He has given me. It helps me as well as the clients. Why does our community need Horizons? Low wages and the lack of jobs make it difficult for many in our community to provide for themselves and their families. Can you share a Horizons experience that is especially meaningful to you? One day we needed bread for sandwiches. Mark left to buy bread, but forgot his wallet, so he didn’t have any money for the bread. Before he could return to the soup kitchen, Panera came in and donated 7 boxes of bread! God knew exactly what we needed and exactly when we needed it. This is a daily occurrence! What has surprised you most about working with Horizons? God blesses the soup kitchen with specific needs, just when we need it. The blessings never stop. What do you wish other people knew about Horizons? How generous the local businesses and community are to Horizons. I also wish everyone could experience the Blessings God gives us when we are in need at the soup kitchen. What keeps you coming back to volunteer? It completes me.